We received a great response to our call for volunteers to be a voice for the Big Local programme. We are pleased to welcome 16 ambassadors who will help us represent Big Local nationwide. Each ambassador will help us spread the word about Big Local and the benefits of putting residents in the driving seat. The ambassadors took part in a training workshop earlier this month, and will now be getting involved with local and national media work, events and other opportunities to talk about the positive difference that Big Local has made for them and their area. We look forward to hearing more from our ambassadors and for them to have the opportunity to share their passion for Big Local – watch this space! Anna is chair of the Tang Hall Big Local partnership, and is incredibly passionate about the programme. With a background in marketing, Anna has experience with media, and manages the Tang Hall Big Local social media. Barbara is an active member of the partnership board for Grassland Hasmoor Big Local, and Chair of LINKS CVS, the Chesterfield and North East Derbyshire Council for Voluntary Service and Action. She is an active community member, acting as school governor for two local schools. Christina has been a member of the South Bermondsey Big Local for over a year, and is the chief executive of an UnLtd-funded green project, Edible Avondale SE1. Christina is currently undertaking a community engagement course. David is a board member and secretary for Warwick Ahead – the Big Local Community Board – and a member of the local steering group. He is heavily involved in various community schemes in his local area. Ellen is a member of the partnership committee in her Big Local area, and started the S.I.T project, a support group to help people with mental health conditions or those feeling isolated, offering one-to-one support and running activities to build people's confidence. Emma was press officer for Newington Big Local, and was involved in the programme there since the very beginning. Her role as news reader for the local radio station has also provided her with valuable media experience. Emma recently moved house and is now involved with Big Local in her new area: Elmton, Creswell and Hodthorpe. Hannah is the Big Local photographer for her area and an active resident; she is currently working to set up a ‘Little Local’ for 11-18 year olds: an initiative to get younger people more involved in their community. Lianne is a facilitator for Big Local, helping to deliver the programme in MyClubmoor. Lianne also founded a community youth group for young people aged 11-19, which has won eight local awards, and is an executive director for Sports Alive, a local community interest group. Previously the local councillor and then chair for his Big Local area, Mike is now vice chair, and has remained fully involved in Big Local events. Mike has represented Big Local at an event as part of the Business in the Community initiative. Nick is the partnership chair for the Three Parishes Big Local, having been involved from the beginning. Nick has previous media experience through a role as a college marketing director. Patricia represents the London and Quadrant Housing Trust in Chinbrook Estate Big Local. 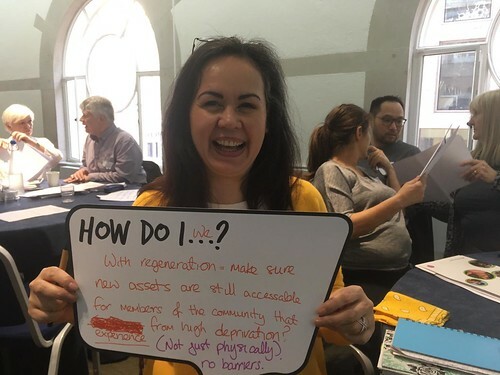 Patricia has a background in community engagement and regeneration, and has delivered projects at local, regional and national levels, establishing and working with a number of local grassroots organisations. Ralph is currently chair of the Sale West Big Local board, and has been involved in his community for over 20 years, through roles such as school governor and board member for the local housing association. Ron is a member of the management committee for Radstock and Westfield Big Local. With years of experience in presenting to conferences and panels, as well as handling local radio, Ron is passionate about promoting youth involvement in his community. Sue is on the partnership of Whitley Bay Big Local, and has just stepped down from several years as chair. She been a senior officer in a number of different local authorities and a senior educational psychologist. Sue has experience establishing policies and procedures for Big Local, and has delivered workshops for Local Trust events. Suzanne is vice chair of White City Residents Association. She spent two years on the Wormholt and White City Big Local partnership and secured many local business sponsors. A women's centre founder, with media experience at Radio Thamesmead, she is now developing a podcast network with a creative criminal justice charity for youth. Valerie joined South Bermondsey Big Local in its second year of funding in 2012, while she was the secretary of the local tenants and residents association, helping to plan local events. Now, Valerie is training to become a community engagement worker within her Big Local group. For tips on communicating about Big Local, view our Storify of the ambassador training sessions.